So once again during these winter months I’m sharing my most recent recipe for homemade birdseed cakes. The birdseed cake recipe I used a few winters ago was pretty good, but was heavy on the peanut butter (hello squirrels!) and the cornmeal and flour. So this year I’m trying out a recipe with no peanut butter and that uses a bit more lard instead of cornmeal and flour too. 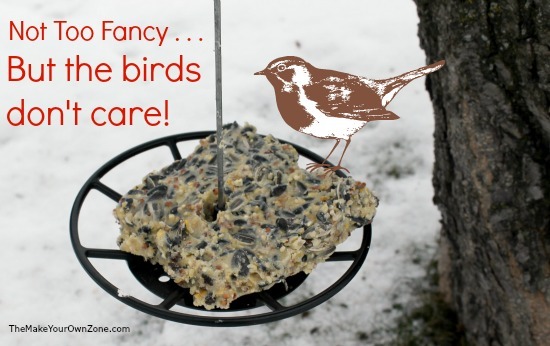 I’ve been reluctant to label these DIY birdseed cakes as “suet cakes” which is the name most often seen on birdseed cakes in the stores. Suet, however is made from beef fat and is much harder to locate for purchase where I live. My best efforts at locating suet to order online came up with a company in England. Apparently suet is the fat of choice for some traditional English recipes. So instead of true suet, I have always used lard. Lard is rendered from pig fat so it is still an animal fat rather than a vegetable fat (like Crisco). Lard is usually easier to purchase at my local grocery store too. 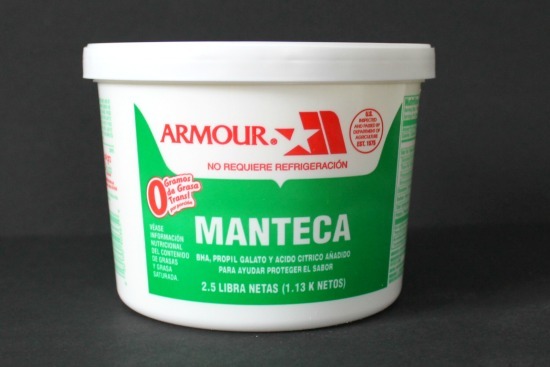 I wrote an entire blog post about looking for lard in the grocery store a while back, with the advice to look in a Hispanic section of a store where it is often sold and labeled as “Manteca” – BUT – on the other side of the tub it is labeled as “Lard”. 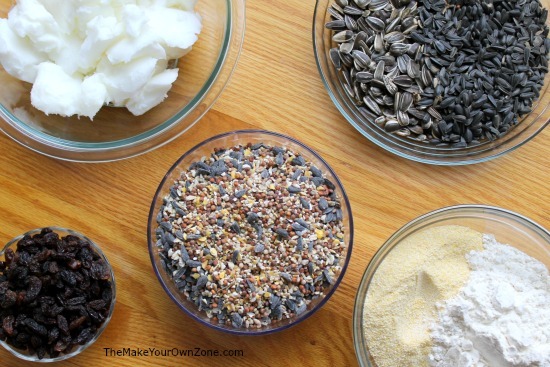 In a large bowl combine the birdseed mix, the sunflower seeds, the raisins, and the cornmeal and/or flour. Stir until everything is well mixed together. Place the lard in a microwave safe bowl. Heat in the microwave until melted. This took 2 minutes and 30 seconds for me. There were just a few chunks still not melted, but I just stirred them around and they quickly dissolved. Pour the melted lard over the birdseed mixture. Stir until everything is well moistened with the melted lard. Line a 9×13 pan with parchment paper. Pour the mixture into the lined pan and spread it around evenly, making sure to get it spread out well to the edges too. (See the notes below for why I put a couple holes in there). Put the pan in the refrigerator for several hours to cool and harden. Tell Hubby when he asks that sorry, those are not chocolate chip cookie bars cooling there in the fridge, those are birdseed cakes. After several hours the birdseed cakes should be hard enough to cut. 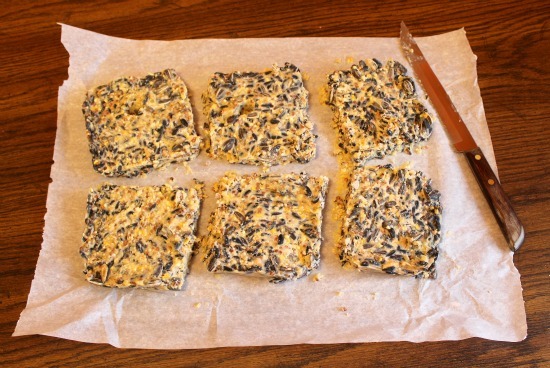 Lift the parchment paper out of the pan and cut the block into 6 cakes that should be the perfect size to fit in most birdseed cake “cages” on bird feeders. There will be some crumbling when you cut the block into your 6 smaller squares. I save those crumbles too and scatter them around under my bird feeder because I’m just thrifty that way and figure some little critter down there will enjoy them. ~~ I did a mixture of 1 cup black oil sunflower seeds and 1 cup striped sunflower seeds. Sometimes the striped ones are a harder to find (I buy them in a store that sells lots of different types of seed in bulk). Therefore I did not put the striped ones in the recipe, but you can make this adjustment too if you wish. 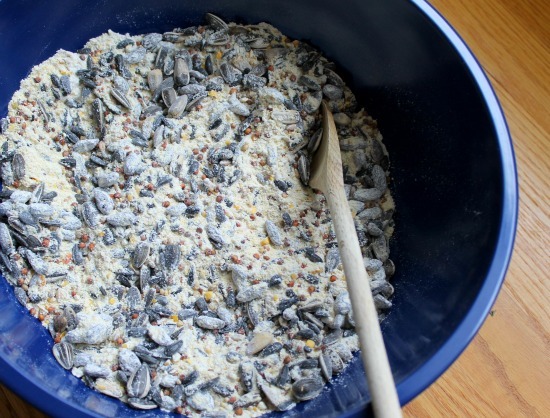 ~~ Although I haven’t tried it, it might also be possible to make this recipe with just 4 cups of basic birdseed mix. 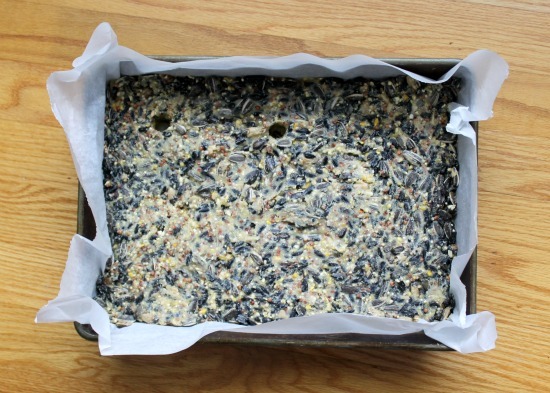 However birds are usually fond of the black oil sunflower seeds so they’re a nice addition to the recipe. ~~ The 3 cups of lard is equal to about 1-1/2 pounds. Lard is usually sold in containers labeled by weight, so make sure you get a container of at least 1.5 Lb size. The containers I usually find in the store are 2.5 Lb size. ~~ For a couple of the blocks, I made “holes” with the end of my wooden spoon before the mixture hardened. I just guessed where I thought the middle of a couple blocks would be. I’m using these blocks on my Birdola Stacker bird feeder . Sometimes I’m ambitious and make these round birdseed cakes to fit on that feeder, but these cakes work on there too (they just don’t look too fancy). 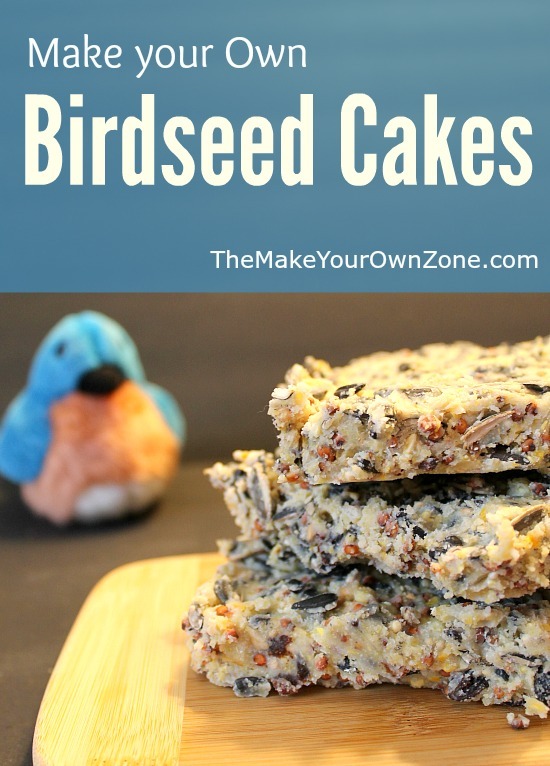 I’ve been using your birdseed cake recipes for about a year, with tweaks here or there depending on what seed mix I am using, and the season. For the hottest summer months, I use gelatin as the binder. I use lard the remainder of the year. The gelatin is expensive, and I get a larger yield when I use lard, so lard is what I use except when hot weather will melt lard. My tip is, for the square cakes, I found plastic storage containers at Dollar tree. One container has two compartments that make 1 perfect sized suet cake for standard suet cages, and one half-cake. The container has a snap-on lid. I mix the seeds and some flour as binder. Then melt suet in the microwave. Mix it together. Spoon it into the Dollar Tree containers, pack it well using fingers and the back of a large stainless tablespoon. Chill it in the fridge. Then I just pop out a full cake or 2, or a full cake and 2 halves, and load my feeder. These dishes are sold 2 and sometimes 3 for $1.00. They stand up to the heat of microwaved lard, but stovetop melting is too hot. My seed cakes are mostly for woodpeckers. Thus, I use a lot of sunflower seed, nuts, meal worms if I can get a deal on them, and less of the smaller grains like millet and cracked corn. Tractor Supply always has gray striped sunflower in stock. 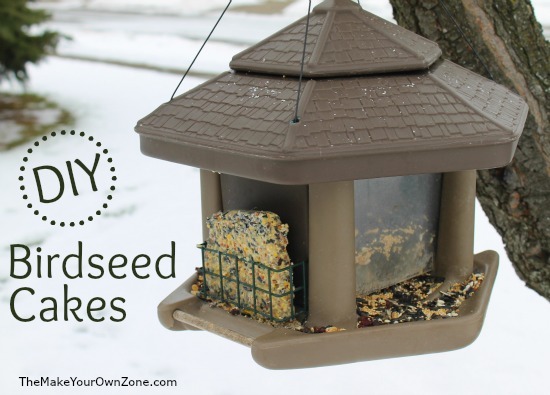 I have a local garden center that always stocks high-end bird seed in bulk bags, and also sells by the pound, so it’s easy for me to find cracked sunflower and peanuts and such to buy just for a batch of seed cakes. I love those tips Amy! 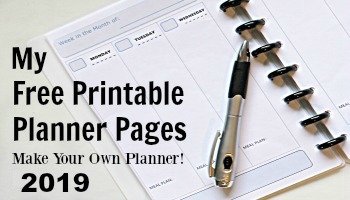 I always like finding frugal solutions for homemade things too. I will be checking my dollar store 🙂 I also find that lard is usually my “suet” of choice and that the woodpeckers are the birdfeeder visitors that seem to like these cakes the best.